Popigai Crater impact: Large asteroids can hit the Earth at a velocity of 15 to 20 miles per second. This produces an impact that is powerful enough to vaporize rock, excavate a huge crater and blast millions of tons of ejecta into the air. The force at the point of impact exceeds the temperature and pressure required to produce diamonds. If carbon is present in the rocks surrounding the impact site, the formation of diamonds is possible. 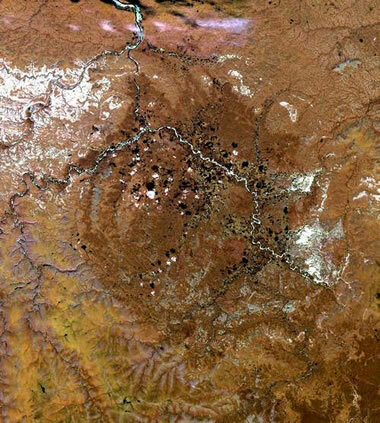 What is the Popigai Crater? About 35 million years ago, an asteroid about 5 to 8 kilometers in diameter, travelling at a speed of about 15 to 20 kilometers per second, slammed into the area that is now known as the Taymyr Peninsula of northern Siberia, Russia. The energy delivered by this hypervelocity impact was powerful enough to instantly melt thousands of cubic kilometers of rock and blast millions of metric tons of ejecta high into the air. Some of that ejecta landed on other continents. The explosion produced a 100-kilometer-wide impact crater with a rim of deformed rock up to 20 kilometers wide. We now know this feature as "Popigai Crater" or "Popigai Astroblem," the seventh-largest impact crater that has been identified on Earth. Related: How Do Diamonds Form? Popigai crater impact breccia: A large 457.7-gram specimen of breccia from the massive Popigai crater in northern Siberia. Note the variety of colors, sizes, shapes and textures within a single mass - the result of a major meteorite impact which threw millions of tons of rock into the air. 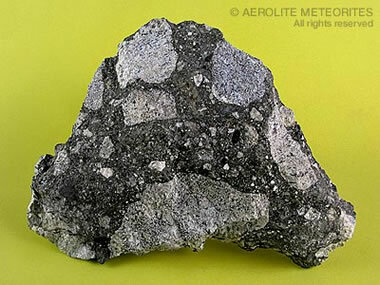 As fragments fell back to Earth, rocks from different strata were mixed together. Millions of years of heat and pressure compressed those assorted pieces into a solid mass known as an impact breccia. Photograph by Geoffrey Notkin, copyright Aerolite Meteorites. What Happened at the Point of Impact? Popigai Crater satellite image: Satellite image of the Popigai impact crater, north of the Arctic Circle in Siberia, Russia. The crater is poorly visible because it has been obscured by ejecta and 35 million years of erosion. Image by NASA. Enlarge image. In the Popigai impact, the conditions needed to form diamond were present for just an instant of time. This flash formation converted flakes of graphite in the Archean graphite-garnet gneiss into diamond. Many of the diamonds produced were small polycrystalline stones that are approximately the same size and shape as the graphite flakes in the gneiss. Most are tiny stones under 2.0 millimeters in size that might be suitable for producing diamond abrasives. Because these diamonds were formed in a flash of heat and pressure, there was insufficient time for large, single-crystal stones of great clarity and purity to develop. For that reason, Popigai is unlikely to be the site of a gem-diamond mining operation. Lots of news stories have reported Popigai Crater as a major diamond deposit containing trillions of carats of gemstone-quality diamonds that Russia has kept secret. This is not true. This diamond deposit has been known to researchers throughout the world since the early 1990s when many of them visited Popigai Crater with permission and support from the Russian government. There are no public documents showing that Popigai is a minable deposit of gemstone-quality diamonds. Popigai is an unlikely threat to other diamond mining operations because the deposit is thought to contain small industrial-quality diamonds. About 98% of today's industrial diamonds are produced in laboratories because it is more economical to "make industrial diamonds" than it is to mine them. Will these Diamonds be Mined? The Popigai Crater is in a remote location above the Arctic Circle, in a difficult environment, with no infrastructure and no local source of employees and support. For the deposit to be mined the diamonds must: 1) be large enough to be recovered and used in industry; 2) have physical properties that are useful to industry; and, 3) be present in high enough concentrations to be economically mined. The Russians have not released any information to confirm that the deposit is minable. Impactites - Ghostly Footprints of Ancient Meteorites: Geoffrey Notkin, Meteorwritings, Geology.com, 2009. U-Pb Analyses of Zircons from the Popigai Impact Structure, Russia: First Results: Richard Armstrong, Sergei Vishnevsky and Christian Koeberl, Impacts in Precambrian Shields, Juri Plado and Lauri Pesonen, editors, Springer-Verlag, Pages 109-116, 2002. Impactites from Popigai Crater: V. L. Masaitis, Lunar and Planetary Inst., International Conference on Large Meteorite Impacts and Planetary Evolution, Page 51, 1992. 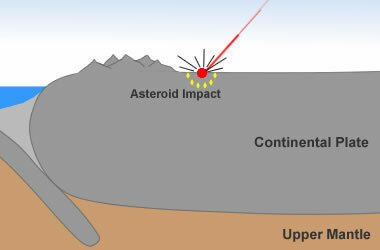 Modeling an Asteroid Impact - Did It Kill the Dinosaurs? : Maureen Oakes, Los Alamos Research Quarterly, Los Alamos National Laboratory, 2003. Popigai Impact Structure: Keenan Lee, fact sheet posted on the Colorado School of Mines, Department of Geology and Geological Engineering website, February 2004. Popigai, Siberia - Well preserved giant impact structure, national treasury, and world's geological heritage: Alexander Deutsch, Victor Masaitis, Falko Langenhorst, and Richard Grieve, Episodes, Volume 23, Number 1, pages 3 - 11. Diamond (Industrial): Donald Olson, United States Geological Survey, Mineral Commodity Summaries, January 2012. Lonsdaleite: Mineral description, Mindat.org, last accessed December 2016. Harder than Diamond: Superior Indentation Strength of Wurtzite BN and Lonsdaleite, Zicheng Pan, Hong Sun, Yi Zhang, and Changfeng Chen, Physical Review Letters, 102, 055503, The American Physical Society, 2009. Which Countries Produce the Most Gem Diamonds? : Website article, Geology.com, last accessed December 2016. Small amounts of lonsdaleite are reported to be present in the diamond-bearing rocks of the Popigai crater. Lonsdaleite is a rare carbon mineral with a hexagonal crystal structure that has been associated with diamonds in meteorites and at impact structures. Like diamond, it is a mineral that forms under conditions of very high temperature and pressure. It is often referred to as "hexagonal diamond." Some specimens of synthetic lonsdaleite have been reported to have durability characteristics that exceed those of diamond. These characteristics have not been reported in natural specimens or in specimens collected from Popigai Crater. The Russians have significant expertise in diamond mining, synthetic diamond production, and the use of diamond as an industrial material. Alrosa, the state-owned diamond mining company of Russia, produces more natural diamonds than any other company in the world and is a significant producer of synthetic diamonds. Russia as a country produces more gemstone diamonds than any country other than Botswana. They have been mining diamonds and producing them in labs for a long time. If Popigai was a financial bonanza for any reason, they probably would have been mining it a long time ago.